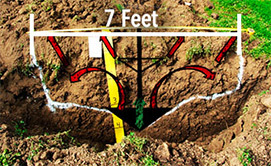 The success of establishing vines & orchards in a commercial venture relies on the basic steps of understanding the soils and how to treat them before planting. Ag Soilworks tailors precision deep ripping and development techniques to specific soils using the patented Vibrosoiler ripping process, deep fertilizer mixing, discing and bedding in a GPS-ripping pass. 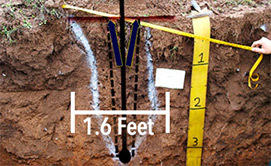 Proven soil conservation & water saving techniques of 40% (GWRDC). GPS irrigation with consistently superior results. The Vibrosoiler® provides 4 plus times soil breakout from that of a standard ripper. This removes compaction and the plow pan and increases water and nutrient penetration into the soil profile. Poor breakout with limited benefit. Requires ripping very close to vine.